So I wasn't here yesterday. Tuesday evening involved me making a Prawn & Chorizo Jambalya, which turned out to be more successful than I expected while watching it cook. Still, I don't think it'll be repeated. Too much effort for too little reward, really. And on Wednesday I got to sleep in a little later and then frantically rush off to the Rhino & Lion Park for a company away-day. I'd stupidly figured I'd just look up the directions to the place online before I left home in the morning ... what I didn't count on was their website being completely unavailable (I can only assume it had something to do with a broken cable plaguing South African Internet users for the last few days). Actually, it's still completely unavailable. How annoying. Anyhoo, it meant Varen & I were frantically searching online and in the gps trying to find the route there, which I eventually did ... and it was easy-peasy, but *very* badly sign-posted!! I mean seriously? Anyhoo, we had a cool game-drive around the Rhino & Lion Park. Although we couldn't find the wild dogs. The lions also weren't very interesting to see, just lying around on burned grass. But the rhino's and buck variety were pretty awesome (so many baby rhinos, including one only 3 weeks old!). 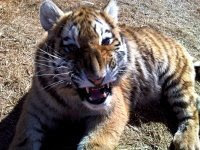 And then the more fun part ... getting up close with some of the babies and I got to see white tigers for the first time! Sadly we missed out on a visit to their breeding center which was the bit I really enjoyed the last time I went (absolute years ago with my folks when I was still dating Bean). After that we all headed to Al Fresco for lunch. I was a little worried cause I'm not likely to usually visit a restaurant with their name painted in giant letters on the wall on the side of the road, if you know what I mean. But the food was good and we had a great afternoon and didn't even end that late (I was home around 5pm).